1 of 3 Cook ground beef in a large nonstick skillet over medium-high heat for 5 minutes, until browned, stirring occasionally. Stir in 3/4 cup water and taco seasoning. Reduce heat to medium-low and simmer 5 minutes, stirring occasionally. Stir in refried beans until well combined and heated through. Set aside. 2 of 3 In a medium-size bowl, mix together tomatoes, 1/2 cup of the scallions, the sugar, garlic salt and black pepper. In a second medium-size bowl, mix together 1-1/2 cups of the shredded cheese and the sour cream. 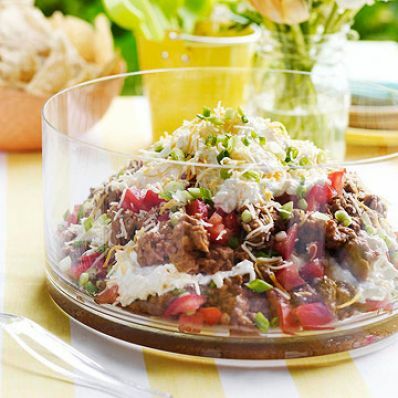 3 of 3 In an 8-cup clear bowl, layer half each of the beef mixture, tomatoes and sour cream mixture. Repeat layering. Scatter remaining 1/4 cup scallions and 1/2 cup cheese over the top. Serve at room temperature. Per Serving: 216 kcal cal., 15 g pro., 537 mg sodium, 3 g fiber, 7 g sat. fat, 12 g Fat, total, 54 mg chol., 10 g carb.